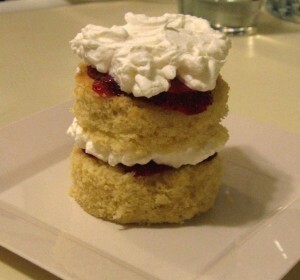 Mini Strawberry Shortcakes - Kosher In The Kitch! Mini Strawberry Shortcakes - Kosher In The Kitch! Take a basic white cake, super-fresh slices strawberries, and parve whipped cream. Select a medium sized can (smaller than a regular tomato sauce can, but bigger than a tomato paste can) and remove the top and bottom of can. This is what I used for the cake rounds. Unmold the (cooled) cake from its pan onto a cutting board and, using the can, cut out rounds of white cake. Push the cake from the bottom of the can from the top (cake will get slightly stuck, be careful). Then, slice the cake rounds in half widthwise (to make 2 thinnner rounds). Layer cake, strawberries, and cream. Use a fork to gently spread the cream evenly. Repeat. The recipe is written out above and yes, it is Kosher! But, how do you make the basic white cake? She didn’t give the recipe she used however a duncan hines mix would work just fine! Sometimes the most obvious things are staring you in the face and you miss them. The idea of using the can as a form cutter – I can never find a donut cutting form here in Israel, and next Channukah I will take an extra large can of peaches or something, and be able to cut the sufganiyot shapes into a perfect size. THANK YOU! THANK YOU!